As elucidated before, Riddler is one of Batman's greatest foes - because while others may reflect him, Riddler is the only one who can match him. Yes, Batman ultimately wins, but mainly because it's his name in the title. Batman has lots of enemies who are stronger than him, but how many are smarter? Mr. Nygma took a long time to join the ranks of Batman: the Animated Series - it wasn't until the 41st episode ("If You're So Smart, Why Aren't You Rich? "), two and a half months after the show premiered. He was a game designer who was fired, and came looking for revenge when his former company was going to be sold to Wayne Enterprises. There were a lot more electronics than usual in his gimmick, but that was just a setting update; the character's core - an obsession with puzzles - remained the same. Always sure he's the smartest guy in the room, the Riddler is basically a smugness engine that runs on confidence. Or a confidence engine that runs on smug. Either way. The figure has a wonderful lopsided smirk on its face, with one side sedate and the other curving up higher than his nose. Amusingly, this is the same expression the Four Horsemen gave their DCUC Riddler, just exaggerated. Before appearing on the '60s Batman show, Riddler's costume of choice was green tights with black question marks all over. But Frank Gorshin didn't like wearing that, so he asked the costume department for a suit instead. The long johns lingered in the comics for decades, but BtAS went sartorial: Riddler is wearing a green jacket [he won the Masters? --ed.] over a black shirt and a gray tie with a purple question mark on it. He has purple gloves (to avoid leaving fingerprints) and grey pants, though the green shoes are an unusual choice. His mask is purple, and he tops it all off with a green bowler. Appearing on the cartoon fairly cemented the suit as "the" Riddler costume, and he's barely ever worn spandex since. Riddler comes with the usual assortment of interchangeable hands - two fists, two holding, and two relaxed - and his trademark cane. 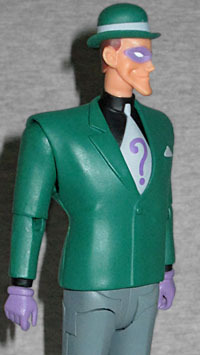 BtAS gave him a normal cane, not a question mark, so that's what the toy has. 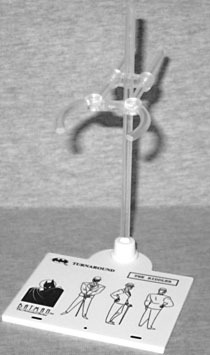 Additionally, he comes with an episode-specific accessory that marks this toy as coming from the episode "Riddler's Reform." In that episode, he want to work for Wacko Toys, so he comes with their Toy Fair display! No, really! 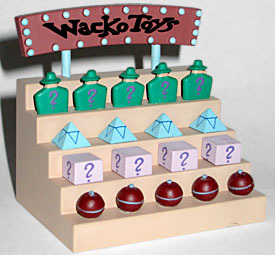 It's a five-tiered shelf with different toys on each step: red balls that are secretly two-way radios, pink boxes with question marks on them, blue pyramids (The Riddler's Riddlymids - "hours of fun for only $19.95! "), and green Riddler figurines. It's always special to get toys of toys. Now, the pyramids (which function like Rubik's Cubes) should be white, but the intention is clear. All the toys are separate pieces glued in place, which does cause a bit of a problem: the figure I bought came with a stand that was missing one of its boxes; I got a replacement, and it was missing one of its Riddlers; I had to use two different figures to cobble together one complete release. On the plus side, all the individual toys on mine are now removable, rather than being firmly glued in place. I haven't gotten any of DC Direct's Batman: the Animated Series figures since they took that break to work out the broken joints issue - all previous orders were cancelled and the items resolicited, and my local comicshop kept selling out of them. But come on, this is the Riddler! He's wearing his stylish green suit, and comes with toys of toys! What could be better? Now, lest you think we've forgotten to give you the answer to the riddle at the head of the review, you've missed it. You should go back to where it all started and look again. Or, if you want to prove you're as smart as the Dark Knight, we'll give you one more oblique clue in the form of a riddle with a different answer: "whether onset, offset, cant or curved, a scoop, sidewall and pocket make up its head." If Batman didn't have the answer by this point, he'd hang up his cowl in shame.